San Antonio has been playing much better of late and will hope to knock down the 2X defending champs. DeMar DeRozan has even been playing better of late, and now they have no Derrick White. Let’s see. 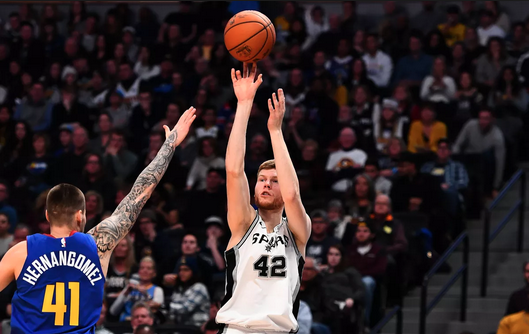 Golden State’s lineup of doom has been winning them every single game, and nobody seems ready to take a stand to stop them. At 37-15, they have only the Nuggets and Thunder to truly worry about. This has been a season of injuries for San Antonio, despite their impressive record and showing in a number of areas. They are #13 in points scored and #14 in points against, but in all of their home games there has been a weirder storyline: the infiltration of all the bats, and no Manu around to take them out. But, speaking of this being a season of injuries, they will be resting LaMarcus and DeRozan tonight, while Derrick White misses another game with plantar fasciitis. This is a dream scenario for Rudy Gay, who has had a number of years in his career in which he was serving as his team’s #1 option. It’ll be the case against the best team in the entire league. He and Bryn Forbes are going to have their work cut out for them, having to carry the scoring load, but anything can happen. The highest scoring team in the league, the Warriors have been killing it this year. At 37-15, they have the best record in the West, with the Nuggets right on their tails. DeMarcus Cousins is averaging 15-7-4 in five games, while only playing 21 minutes a contest, but all he has to do is avoid foul trouble, and his minutes will go up. We all know what Steph, Klay, and KD are able to do, so if Cousins does come around, well, that’s the end of the league as we know it. Outside of Damian Jones, who won’t be back this year, the team is at full health, and the next 30 games will provide the rest of a trial run with the starting lineup, that will lead right into the postseason. All of the starters have thrived off of playing with one another, so there is nothing that the Warriors are not doing well right now, unfortunate to all of the fans of other teams hoping they finally fall. Make sure to bet GS -11, because with all of the guys out for the Spurs, it won’t be pretty, and it sure won’t be close. KD is going to go for 35, while Curry bounces back from the Laker game with a 30-point night himself. It’s hard to predict who may lead the Spurs in any category, but it’s safe to say they will be obliterated by their rivals.